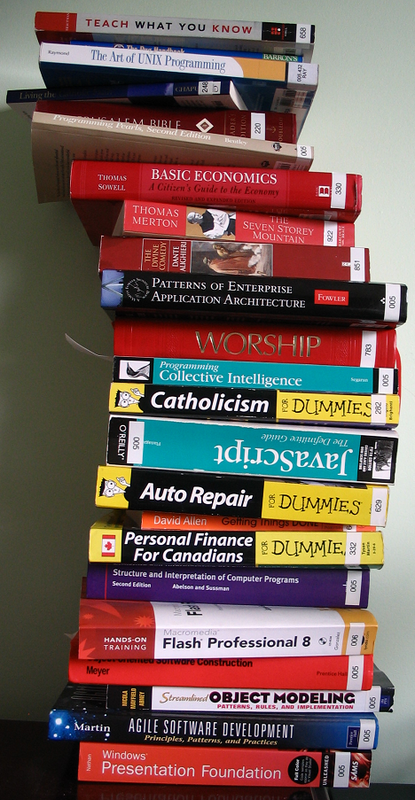 Because of the nature of this stack, books that are frequently used float to the top, and rarely accessed books sink to the bottom. So at the top is "Teach What You Know" (on training others, which is a part of my job) and "The Pug Handbook" (I'm taking care of my brother's dog this month). Also, "The Art of UNIX Programming", which is a fascinating patterns book recommended by a colleague. At the bottom are some books I wish I never purchased (note to self: always read a chapter of a book before buying). Why did I spend $50 on "Windows Presentation Foundation"? Good reviews, yes, but I don't use WPF. Again, amazing reviews of "Streamlined Object Modeling", but I have found this text to be rather dry: "R48. [Role] A regular library patron can only collaborate with closed-ended resource holds; a researcher patron can collaborate with open-ended or closed-ended research holds.". Not my style at all. Great books I've barely started: Programming Pearls. Patterns of Enterprise Application Architecture. And where am I going to find the time to squeeze in Structure and Interpretation of Computer Programs? Basic Economics is one that I'd like to re-read - it's written in a surprisingly engaging way. I'd also like to re-read Getting Things Done to get a refresher on the fundamentals of that time-management system. posted by Jonathan at 8/31/2008 09:24:00 a.m.
That actually takes longer than reading the books but possibly requires less mental energy. Of course you're probably doing it wrong if you don't write your own Scheme REPL in Scheme by the end of Chapter 1 but I found the videos helpful. By Thomas David Baker, at 8/31/2008 11:15 a.m. Cool stuff Tom. I know you've gone through the videos - I should give that a go. In the tub. By Jonathan, at 8/31/2008 7:40 p.m.